This episode starts with a battle reminiscent of WWI as a biplane flies overhead shooting the people below. In amongst this is a boy running away from something in fear. A soldier tries to rescue him but Handmines pulls the soldier underground and all the hands trap the boy. And then the Doctor arrives to save him, throwing his Sonic Screwdriver to aid his escape. The eyes in the hands watch him as the Doctor tries to do so and when the Timelord asks the boy his name he is faced with a difficult decision for the boy’s name is Davros. Cue titles and an alien monk/bounty hunter named Colony Sarff is looking for the Doctor all over the universe. Then he arrives on Karn to give a message to pass on to the Doctor saying Davros knows, Davros remembers. The Sisterhood of Karn are protecting him but who is protecting Clara? Meanwhile Clara looks out of the window of the school to see an aeroplane has stopped moving mid-air, just hanging there. Off to UNIT she goes to try and help with the crises along with Kate Lethbridge-Stewart. They are struggling to trace the Doctor when Missy contacts them asking for weapons to be trained on her and to offer them her help. What is she up to? It is then that we discover Missy is looking for him too, that she has been left his last will and testament called a Confession Dial. It is also her responsible for the planes freezing worldwide. Clara and Missy then work together to find him and they do by going back in time to find him playing guitar on a tank like a rock god a thousand or so years before in a duel of sorts and he seems disillusioned and confused. It seems the Doctor is dying and then the monk arrives, a huge snake in human form. 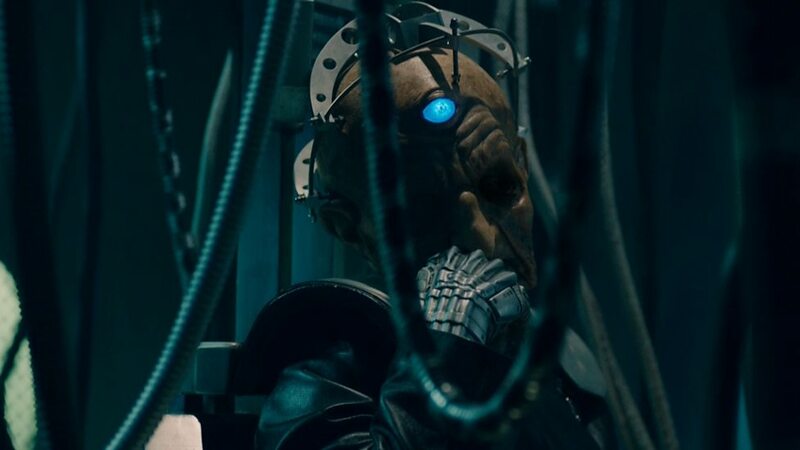 He is to take him to Davros alive but the Doctor is unsure why until he is shown his Sonic Screwdriver and is ashamed of something, of leaving Davros to his fate with the hands. They go off as prisoners as such but the Doctor has not realised Dalek agents were with him all along and they have his Tardis. It seems not everything is as it seems and then the Doctor meets Davros finally. Meanwhile Missy and Clara find out where they truly are. Daleks of all different era’s are there and they want to destroy the Tardis and Missy wants to help them use it. Missy is exterminated and Clara is next whilst the Doctor begs Davros for her life but too late. And then they turn their attention to the Tardis. Suddenly the next scene is with the Doctor about to kill the boy Davros. Finally the Timelord and Clara are back whizzing around time and space in the infamous blue box the Tardis saving the universe from evil in tier unique and eccentric way. Unfortunately the lovely and brilliant Jenna Coleman who plays Clara Oswald is leaving at the end and will be ‘killed off’ it has been revealed. She will be playing a young Queen Victoria in her new venture amongst other amazing things. I just know she will be huge in Hollywood if she chooses that path but for now we have the pleasure of her company for most, if not all of this series. This episode started with a bang and what a bang it was, dark question hanging over the entire series throughout its entire history. Would you go back in time and kill an innocent before they become the monsters they are as adults or do you let them live knowing what you know? If you did change the past how would it affect the future? If you could go back and Kill Hitler as a child would WWII have happened or would it have been worse without him? Would someone else just as bad have taken his place and committed worse atrocities than we could possibly imagine? This episode plays with that question and does not let up for one minute. In fact I was breathless after it had finished and having now seen it twice I am still in shock at what has so far happened but this is Doctor Who and nothing is ever as it seems. Or is it? Shocks throughout, this episode did not fail to surprise and I could only imagine Steven Moffat laughing his head off as he wrote it saying to himself, “That’ll teach ’em” to those that want him to leave as he wrote one huge line after another. Indeed, after just this one episode he has probably cemented his tenure at the Chief Writer for another few seasons should he wish to stay. I of course still have problems with the Master being Missy and the line about the Doctor probably being a girl when he was younger is just another attempt to make us get used to the idea of him becoming a she is the very near future; probably when Capaldi leaves no doubt, certainly after the next regeneration after his anyway. Again, I do not like the idea of this being forced upon us and neither do I find it necessary either. To me that is lazy writing and not good for women actors out there either who do not need to take a male role but should have their own unique one specially written for them. But hey, as some friends of mine and I said the other night before it aired, a fan like Moffat should not really have free reign for they are writing out their fantasies and not what the show needs. Maybe it needed a writer who was not a fan but someone who would have done it justice without changing too much of its back-story and history as well as iconic characters. I feel that the whole female Master/Missy/Doctor story is intended to play to a PC world gone mad and nothing more. Doctor Who should not be used as a political platform but as what it is, a show for families; children and adults alike. Saying that though I found this one of the strongest episodes there has been in recent times and next weeks looks to be just as good, if not better. 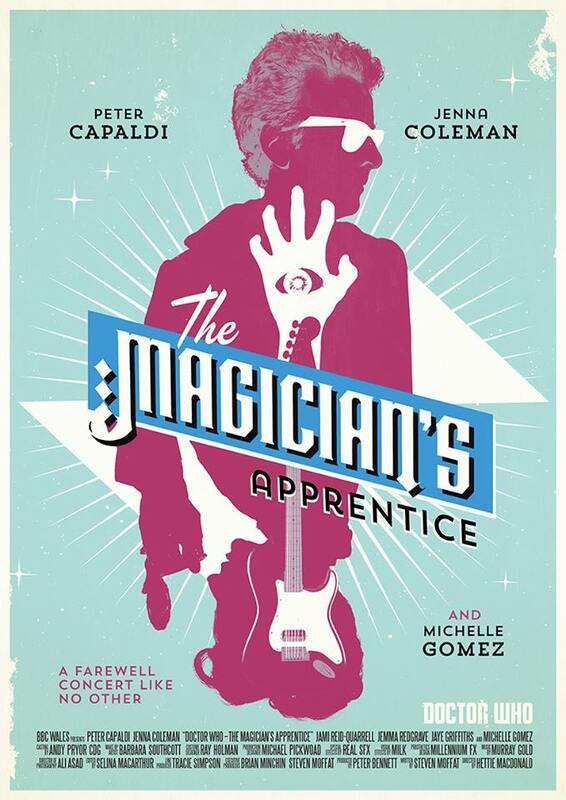 Each of these episodes is part of a two-parter and the episode titles are the reverse/opposite of the other so this one is called the Magician’s Apprentice whilst the next is called the Witches Familiar where the stories seems to be running backwards right up until the last episode of this series especially when you read the synopsis of each one. It is easy to see that there is a mad plan there and I think it very clever of the team to do this. Also there was a touch of the Walking Dead and Game of Thrones in this writing with the death of two characters, if indeed they are in its writing technique for killing off strong characters; but again nothing is as it seems in Doctor Who. Watch this and enjoy if you haven not already? If you have then watch it again like I have and look out for little clues to the rest of the series and one final question. Will Clara ever become the Dalek that Matt Smith regeneration found on Skaro when he first met her? We shall have to wait and see. By the way, please look into Stuart Manning’s artwork that is at the top of the page here. He now sells his prints and does commissions too. You can view his work here and buy them here. ← Doctor Who: A New Female Regeneration?